For the lucky 13th time around, Pollard has joined forces with team Tobias brothers (Todd and Tim, respectively), to deliver yet another slab of 1st world weirdness. Since their inception in 2001, Circus Devils remain one of the most interesting and thought provoking projects in the Pollard cannon. Following last year's unexpectedly subdued, and beautifully arranged Escape LP, the Ohioans plug in, turn up, and get back on their gas powered go-karts. On Stomping Grounds, Pollard and the Tobias brothers often tread a fairly conservative line, delivering a hefty chunk of material that could easily fit snugly in many Pollard solo affairs of years past. In fact, Side A is downright "normal" for most of the ride. Side B is where things not only get interesting, but also mighty good! Gone from this record are any obligatory instrumental tracks these guys seem so fond of. Always a major Circus Devils' gripe, those instrumentals often feel like a showcase for Todd Tobias' synth swells while Pollard is off scratching lyrics in a notebook at the wrong time. Luckily, here, every song's Pollard backed, and fully realized. 500 copies released worldwide on black vinyl. Come set a heavy lead foot on the Stomping Grounds! Schedules of the Dead- 3 This opener falls back into mid to late 2000's Pollard solo quality. Verses are kind of a funky mix of guitar boogie and thumping bass. The chorus seem pasted on, out of place, as Pollard simply repeats the title. The whole things has that walkin'-with-attitude feel. Like a mold under a bathroom sink, this song's a slow grower. Seeds of the Craft- 3 Classic Pollard bellowing over grungy guitar thrashing. A fairly straightforward short piece. Could've been a semi-nostalgic gap track on one of the GBV reunion records. Cold Joker- 2 Another take that could slide safely onto many Pollard solo outings. Very few, if any elements distinguish this as a Circus Devils song. Unfortunately, this mundane track is dragged down by Bob's instance to rhyme every lyrical phrase with the next in some of the worst possible ways. Hue N' Dye- 5 Slow burn, minimalist indie rock jam at its finest. Could be a Pavement outtake Pollard sat in on. Glassy eyed, and on less than 2 hours sleep, this song drags you by the eyelids into the morning daybreak. Hauntingly beautiful yet commanding. I'm Goin' In- 2 Fairly run-of-the-mill filler track. A fuzz guitar chug fest for most. Pollard adds some slightly ridiculous vocal bends that almost feel appropriate. Infectious in a way, and perhaps for all the wrong reasons... Rather forgettable. Weed World (Is Growing Very Strangely)- 1 When the Tobias brothers and Pollard get together for these affairs, you often know you'll be off the beaten path for most of it. When it works, it can be flooring. When it's forced, it plays out like this trite, repetitive, mind-number of a song. Weird for weird's sake, and transparent in its attempt. A Bumbling Reply- 4 Tribal drum stomp meets sparse looping guitar riff, along with oddly addicting vocal melody. Pure manic bridge build up explodes into oblivion and then we do it all over again. Girl In Space- 2 One of the two tracks released on the the first EVER Circus Devils 7'' single (7'' is not reviewed on this site as both songs appear on this LP). Unfortunately, despite being given "single" status, this is a solid Pollard solo-esque FILLER track; mid-tempo grungy snooze verses meet airy twinkling chorus for below average results. Wise Man's Lament- 3 Chilling hollow bass plucks open the track while ambient soundscapes sweep by. Pollard talk-sings like an old man from the dark cave on the other side of the tracks. A slow bow dragged across a cello enters the scene midway. A dank and abysmal mood piece, but can't get enough of it. Dr. Pompous- 5 File this one under the would-be category of "doomsday pop." A true sluggish grind full of infectious melodies, brittle guitar leads, swelling bass throbs, minimalist percussion, and perfectly suited sound scraps. The chilling "ohhh-ewwww" parts take this to another level. Sunflower Wildman- 5 Minimal psych genius. A cumbersome come-down from a strange trip, or rather an inward reflection into the unknown. Excellent lyrics, perhaps told from the Sunflower Wildman's point of view. Simple melodies strewn about like cobwebs in the family attic where you spent your winter days waiting for the spring's relief. Excellent closing harmonies. Chilling. Stomping Grounds- 3 Slow stomping track that builds and builds as Pollard sings dead-eyed toward the land of tripping balls. Moody, monomelodic dissonance that cuts deep. All the Rage- 4 Pollard gives a vintage vocal performance over this repetitive, music-box-from-Hell backing track. This one grows on you until you realize it's all that's been in your head for the past week, and you should probably try to get out in the sun more or seek helpful advice from a loved one. Oh, that "ALL... THE RAGE" chant is the only blemish here. Where Hornsby Used to Live- 3 The music; a pulsating, eclectic mix of electronic psych and pounding drum, sophisti-rock. Almost hits all the right spots on this. Nearly epic but falls short. The Liquid Observer- 5 After a 5 song medley of vintage Circus Devils psychotic psych-pop, we get this breezy pastiche track. Somewhat soaked in '70s light AM rock, Pollard delivers, perhaps, his most simplistic beautiful song of 2015. Easy listening to the point of infomercial cheese but it's a worthy display for the ages. Great lyrics and beautiful melodies over razor thin guitar take the cake. I find myself humming Hue N' Dye and The Liquid Observer to myself often. I'm pretty much in agreement with you on all counts here. 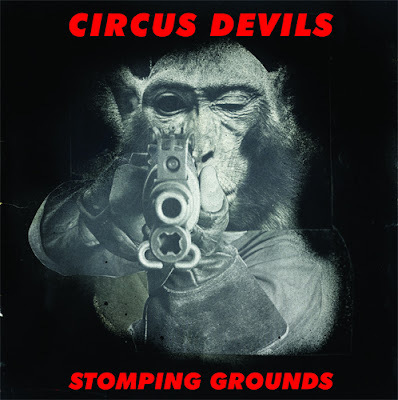 Do you have a favorite Circus Devils album? Hey Dustin. I think my favorite all around Circus Devils' LP is "Gringo" but "Sgt. Disco" is right behind it, as far as an overall achievement. "Gringo" is a fairly "normal" LP full o mostly great songs. Thanks for checking in! Fair enough. "Cold Joker," is hard to stomach based on the lyrics alone and I hate the rock groove in it. Feels cheesy to me. "Girl in Space" is almost good to me, but no matter how many times I hear it, it just feels flat. But as has happened with some of Pollard's stuff, maybe one day they'll just click. Thanks for reading! I really hope Girl clicks for you, I absolutely love that track! Thanks for the reviews, looking forward to your thoughts on Suitcase 4!